Robert Downey jr as Iron Man. IRON MAN 2 returns to cinema screens today and sees Robert Downey jr again take on the mantle of the eponymous Marvel super hero. To celebrate the release of this movie, The Eye cinema in Wellpark has teamed up with Sub- City Comics in the Eyre Square Shopping Centre. Movie goers are asked to hold onto their ticket stub to avail of a 15 per cent discount on all Sub-City merchandise. 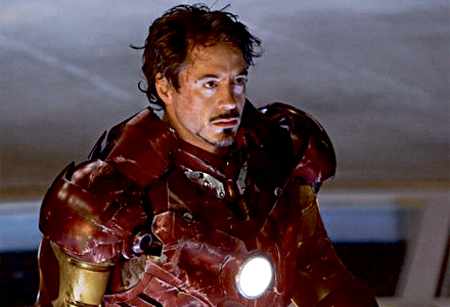 The world is aware that billionaire inventor Tony Stark is the armoured superhero Iron Man. Now Tony finds himself under pressure from the government, press, and public to share his technology with the military. Tony is unwilling to divulge the secrets behind the Iron Man armour because he fears the information will slip into the wrong hands. With Pepper Potts and James Rhodes at his side, Tony forges new alliances and confronts powerful new forces. Early booking is advised. For further information regarding bookings see www.eyecinema.ie or call 091 - 780078. Wellpark Comics Film Eyre Square Shopping Centre Marvel Comics The Eye Iron Man Fictional cyborgs Robert Downey Jr Sub-City Iron Man 2 Sub- City James Rhodes Pepper Potts Tony Stark Action video games Sega games Pepper Potts Robert Downey, Jr.